This past month I arranged a visit to 44 Farms, our primary beef provider, to take a first hand look at where our beef is sourced. 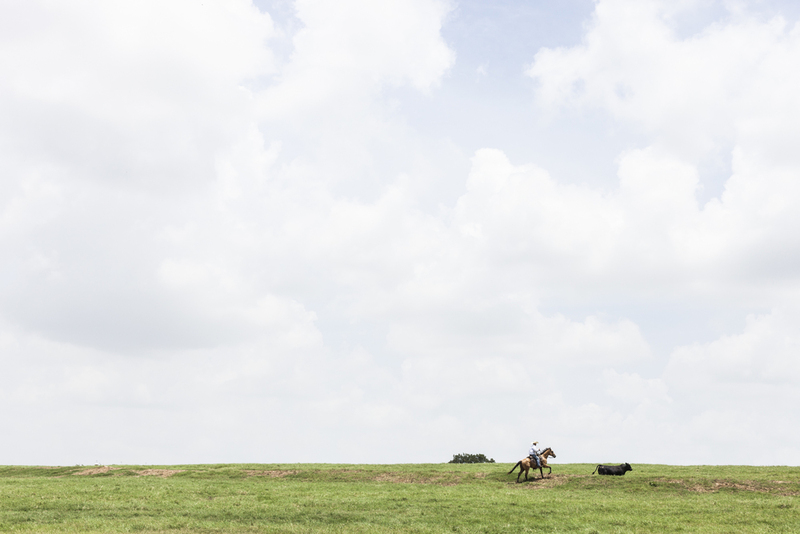 Nestled in the sleepy Texas town of Cameron, 44 Farms operates like a sanctuary — for man and bovine alike. The land and farm belong to Bob McClarren, who carries on a tradition of cattle farming that has existed in his family since 1909. 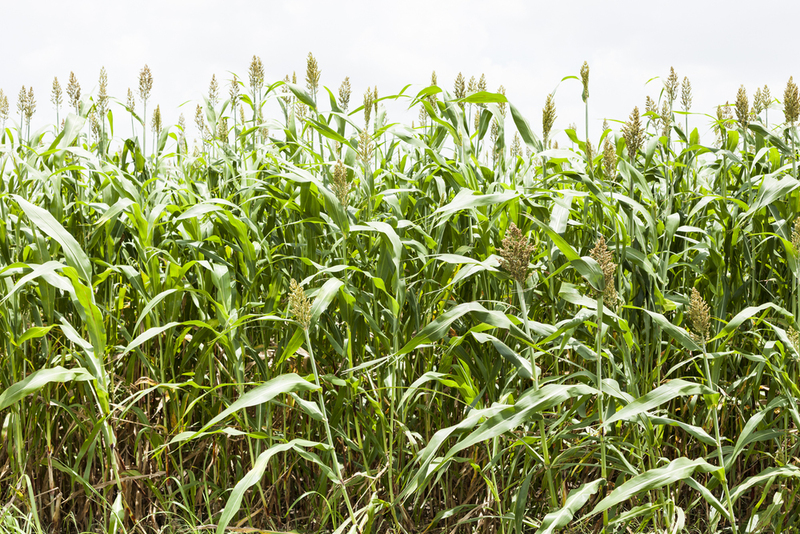 But while the farm is old, the business itself is relatively new. During the 20th century the farm was split up and sold in pieces, and it wasn’t until the 90’s, nearly 80 years later, that Bob and his sister started to buy and reintegrate previously sold land. In 2003, the 44 Farms brand had its official beginning, with just 60 registered Angus cows. 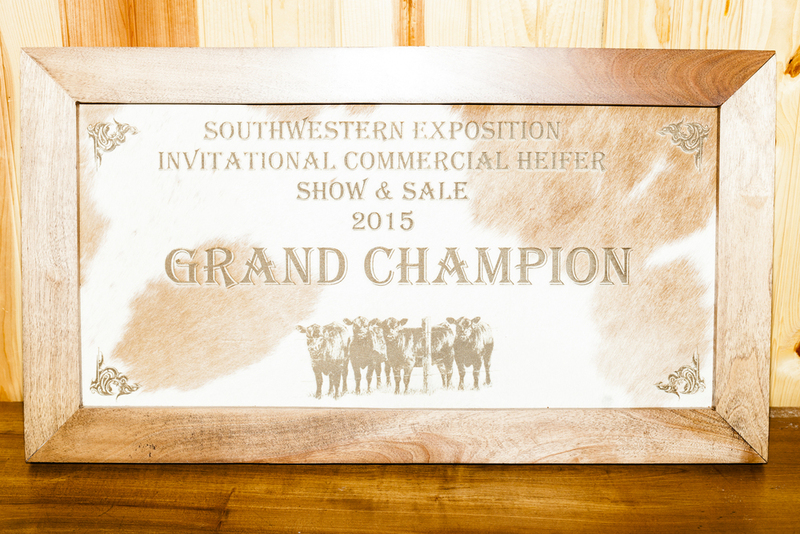 It has since grown to be the largest Angus operation in Texas. Which is no small feat, and one that was achieved with a careful integration of modern and old farming techniques. My tour guides on the farm were Bryan Carroll, the Genetics & Research Manager, and Amanda Overfield, Sales Representative and Social Media Manager. The two of which are perfect examples of how the Farm has successfully adopted contemporary business techniques to help them advance. As Bryan told me, “Customer service and marketing are two of the things we hang our hat on. But our bulls have the genetics to make any cowherd produce quality beef.” He was quick to note the equal importance of managing the cattle and keeping them happy and healthy, which is not something that can be bred. On the farm you witness an efficient, and often times beautiful, merger of old ways and the new. Looking at a cowboy herding on the property, “you know, he’s out there being more old school and I spend a lot of my time on the computer.” The resultant scene is this: genetically exceptional cattle spending their happy days tended on a vast, plentiful land by cowboys who practice an ancient and established method. It’s a pretty picture. One that probably had no small influence in pulling so many people from across the country to work in the small town of Cameron. 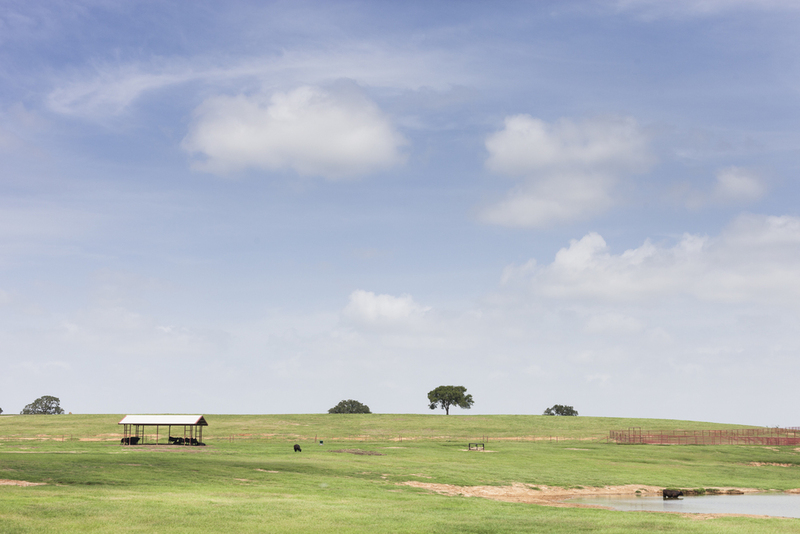 “All the people on the ranch live in Cameron, but only two were born there. Bob pulled only the best people from across the country,” Bryan told me. This includes James, their general manager, who lacked a farming background, yet was imported to Cameron because of his tremendous managerial experience and his long held desire to manage a ranch. Despite the Farm’s modest beginnings on just 250 acres, it’s not hard to see why Bob was able to persuade so many talented people to join his operation. Both the work and the environment are honest and imbued with a purpose which feels quintessentially american. In the brief time I was a guest on the farm, I felt a little bit of the pull, the urge to find a way to spend more time there. 44 Farms has assembled a dream team of employees to manage the land by offering a dream job in exchange. 44 Farms follows the idea that dependance on the land also demands a care for the land. That’s a hell of a belief. And what’s even better, is the sense that this tenant will stand even as the farm grows more successful. I’m more than proud to be associated with the farm. ATTENDING CO-OP STAFF: Stephanie, Nicole, and Brenna. Item B3 Compliance Report pulled off from Agenda. Vote initiated to accept the Agenda: 7 in favor, 0 against, 0 abstaining. Discussion of B3 Compliance Report; Board Members requested verbatim comments from Compliance Poll in future Compliance Reports. Vote initiated to accept B3 Compliance Report: 6 in favor, 0 against, 1 abstaining. John presented the history of the Co-op Movement, Rochedale Pioneers, troughs of reduced activity in co-ops during economic prosperity, peaks of cooperative action during hard times. The impact of membership growth, the founding charter and how it changes over decades, and our commitment to paying a living wage are discussed. Kenley presented revisions to B3.8.6. Scott moved to accept the revisions, Steve B seconded. Vote: 8 in favor, 0 against, 0 abstaining. The Board addressed patronage, taxation of funds, minimum percentages allocated, and loyalty tracking. Cole moved to enter Internal Session for the purpose of D3 Monitoring Report, Q1 Finances, and the Treasury Shares Program. Kenley second. Vote is 8 in favor, 0 against, 0 abstaining. Internal session ended at 2:03pm. The D3 Report was adopted during Internal Session with a vote of 8 in favor, 0 against, 0 abstaining. Kenley unveiled new policy language D11. The definition of net savings was discussed, along with some of the ramifications and uses of net savings. The Board agreed to cast the policy into negating, limiting language and add D11.4.1.3 to outline patronage. The Board voted to adopt D11 with 8 in favor, 0 dissenting, and 0 abstaining. Newsletter and Members’ Assembly topics were outlined, including History of the Co-op, Member Frequency, Ends Fulfillment, Financial Report, and Expansion Survey Results. The Board also called for updates to the Committee calendars. Marcus (guest) announced that he will run for Board of Directors this year. Nicole pointed out the need for candidate recruitment starting in May. The Board agreed to meet May 17th and June 28th. Letter from the Director: How Can You Best Serve Our Co-op? The Members’ Assembly meeting in May was spirited and invigorating. One of the main themes was that Black Star Co-op will continue to grow through member support. We celebrated the many ways that member-owners already serve our co-op, and encouraged everyone to think about how they can help in the future. Lunch is a good example for me. This Spring, the workers challenged each Director to bring a friend to the new Tuesday/Wednesday/Thursday lunch service. I sent the menu to a group of co-workers, and ended up with five lunch guests who had never been to Black Star. Some of them now bring their families for dinner. What an enjoyable way to expand our business! Maybe your life makes it too hard to have lunch at an awesome pub in North Austin (Sorry!). You can still drink Black Star beer in bars closer to home, and request it in the bars that don’t carry it. When you see a particularly mouthwatering photo of a daily special on social media, you can tag friends who would also enjoy that item (They’ll thank you). You can also run for the Board of Directors—just contact joe.silva@blackstar.coop for information on our fall elections. Those are just a few ways you can contribute, but I’m sure you can think of more—participate in a way that utilizes your unique talents. I love being part of a business that pays a living wage to all workers, respects our environment, and serves excellent beer and food. Black Star Co-op is a wonderful example of what community-owned businesses can do. It is inspiring people throughout the U.S., and without you, our member-owners, none of this would be possible. Thank you for all of the ways you support Black Star Co-op. Scott moved to accept the agenda, Steve seconded, 9-0-0 in favor. Scott wished directors would put comments down into policy monitoring reports when directors mark anything other than “completely in compliance” to increase the usefulness of the reports. No committee updates. Steve said March 30 is set for Member-Owner Extravaganza. Kenley asked committees to submit a planning calendar for the larger board to have for review. Annelies said she will not schedule committee updates in the agenda unless committees come to her with items for discussion. Annelies moved to accept, Scott seconded. Before the board vote, Nicole discussed the out of compliance ratings for Patron Experience and the plans the business team have to achieve compliance in a month. Kenley moved to amend the motion to remonitor in April, Joe seconded, 9-0-0 in favor. Nicole then discussed sound improvements and the potential addition of TVs to the pub space and additional staff training. The board discussed the metrics of the Patron Experience report and how tough it can be to shift an overall customer experience rating once hundreds of ratings are in the system. Annelies called the vote on the original motion, vote passes 8-0-1. Charles abstained because he did read the report. Kenley provided an overview of what the Member Investment Share Offering (MISO) was designed to do and the discussion included how dividends are decided by the board, how the board deals with conflicted directors, how put right requests are handled, and the possibility of using a new MISO for expansion. Significant discussion covered how interest rates ought to be set and the benchmarks used to determine them as well as a hypothetical walk-through of the co-op’s ability to honor put-right requests and make future offerings. 9-0-0 vote for internal session (mover and seconder not recorded). Internal session ends at 1:45pm. Annelies moved to accept the D.4. monitoring report, Michael seconded, vote passes 9-0-0. Kenley proposed limited but regular updates from the systems audit committee for board policy revisions. The board talked about best ways to work through policy updates and how to collaborate on them. Cole will take ownership of publishing updates to the board’s internal systems. Kenley discussed his effort to be a facilitator this meeting and asked for feedback on his attempt to offer a structured space for everyone to contribute. Scott said his experience shows parliamentary procedure works best in large groups and that Kenley had spoken quite a bit more this meeting. Steve said the process up to now has worked pretty well. Joe, as devil’s advocate, warned the board not to rely too much on its friendliness always being the basis for effective communication and that some structure helps. Annelies commented that a rotating facilitator might be a good option if an outside facilitator is not possible. Steve strongly supported a dedicated timekeeper. The directors indicated they wish for an outside facilitator. John expressed concern about adding lots of extra voting to situations where consensus is not reached by the board and putting the topic on the next meeting is proposed. Cole said he saw the board proposing three ways to work (formal procedure, facilitation, and straightforward board votes) and that a balance could be had. Charles brought up the consequences of breaking internal procedures and how to deal with the “mistakes” such breaks would create. Annelies asked if the schedule could be allotted in number of minutes rather than specific clock times. Nicole noted how a specific desired outcome helps in Workers’ Assembly meetings. Scott said bringing up time issues should be brought up at the consent agenda. The board reached consensus on Annelies’s suggestion on timekeeping. Steve and Nicole took responsibility for a facilitator search. Members had suggested shifting the MA to different seasons in Austin, such as June-November. Nicole was concerned about getting useful financial statements to the meeting in time. John said he would research possible issues with taxes, certificate of formation, and other hurdles. The board reached consensus on keeping the current schedule. March meeting will be on the 22nd at noon. April meeting will be on the 26th. May meeting will be on the 17th. Members’ Assembly will be on May 31st. Nicole will do the D.2 report, Steve will do the C.2 report, and Kenley will do the B.2 report. Annelies moves to adjourn, Kenley seconded, vote passes 9-0-0. On January 25, our Board of Directors met at McKinney Falls State Park for a day of training, brainstorming, and team-building. Nicole Renaux attended in her role as Board-Staff Liaison and Dana Curtis, Black Star Co-op’s Business Team Leader, facilitated the discussion. All nine of the directors were present: Steve Basile, Michael Handy, Scott Kelley, Annelies Lottmann, Board President Kenley Maddux, Cole Noppenberg, Joe Silva, John Vinson, and myself, the Board Secretary. After satisfying our coffee and breakfast urges, we began the discussion with a round of introductions and icebreakers to learn more about each other. This was important because Michael and Cole have never served on the board and I was appointed to fill a term only a few months before. I am happy to announce: this is a board of directors that quickly established a friendly rapport and openness. Dana then guided us along a discussion of a Board Points of Agreement. We talked about what we expected a high-functioning board would do to ensure respect for a diversity of viewpoints, a healthy balance of work and life, shared responsibilities, and the goal of the board speaking with a unified voice once policy consensus is achieved. It can be hard to foster and protect that communication space with you and three friends at the pub; now imagine doing that with eight others over matters that directly affect the lives of 27 employees and over 3,200 member-owners. This was one of the most important discussions we had, and we concluded it knowing we were in closer agreement on our job than ever before. We then shifted to the subject of Policy Governance, with John and Steve moderating the discussion. One of the most common things we do as a board every meeting is monitor and discuss the progress of the Co-op, the Workers’ Assembly, and ourselves towards meeting this cooperative’s policies. It is not glamorous work, but it keeps the board informed about all aspects of Black Star’s operation and momentum forward. A key aspect of this discussion: the emphasis on the understanding that the board does not “run” things. We have an amazing Workers’ Assembly that takes care of the day-to-day operations. Rather, our focus should be on the future shaped by an understanding of how the operations are in the present. Policy Governance gives us a consistent and useful tool to monitor all aspects of Black Star’s performance so we can decide if current policies meet the values and expectations of member-owners. Next, Annelies took over to connect the broader discussion about monitoring to the practical matter of making decisions based on the monthly monitoring reports. Most of the time the reports shows no concerns to address or areas worth digging into deeper. In these cases, we accept the report and move forward with the monthly meeting agenda. However, there are times when the results of the report spur directors into thinking more needs to be known. The great deal of the trust you place in the Board is demonstrated as we discuss the merits of the policy under inspection, whether the degree of missing the target is sufficiently problematic to warrant a rejection of the report, and what exactly we would seek in a revised follow-up if that were to be necessary. We broke for a lunch of Black Star burgers grilled on the spot and enjoyed the chance to get outside to see more of McKinney Falls State Park. The weather was perfect for a walk and we needed to move around. When we returned, Dana got us back on track with a roundtable discussion of the four pillars of cooperative governance: democracy, teaming, strategic leadership, and accountable empowerment. These high-level concepts were then grounded in the idea of member engagement. We want you, the member-owners, to be engaged with the co-op. However, Black Star member-owners are as diverse as the beers we have on tap. Some love co-ops and want to see them succeed. Some joined because they love the mission and values of our organization. Others value world-class craft beer and cuisine done right and done local. The board cannot forget that we need to appeal to all member-owners and to contribute in the ways that matter the most to them. By the late afternoon, it was time for a beer tasting lead by Nicole. What good is being the director of the best cooperatively-owned brewpub in the world without knowing our beer in depth? We wrapped up the day’s schedule with a vision discussion. Here, any idea was valid. What would things look like for Black Star in 5 years? Where would we be and what would we have experienced in 10 years? In many ways, the role of prognosticator is a director’s most challenging. Industry trends, macroeconomic conditions, the legal and regulatory landscape; these are things that constantly change. We need to be able to anticipate some of this change so the co-op is not caught flat-footed and can continue to provide stellar experiences in the heart of Austin, Texas. November 16, 2014 Meeting 11:00 a.m.
Directors Present: Erin O., Kenley M., John V. Annelies L., Steve B., Charles H., Scott K., Joe S.
Consent Agenda: October 2014 Minutes, B.9 Report, B.11 Report. KM moves to adopt without B.9; SB seconds. Motion carries 7-0-1. Seating of new members: KM moves to ratify election results; AL seconds. Motion carries 8-0-0. JS and Michael Handy to serve 3-year terms. Cole Noppenberg to serve 1-year term. Election of Board Officers: KM nominated President. Elected 8-0-1. CH nominated Secretary. Elected 8-0-1. Election of Committee Chairs: JV nominated to chair Finance Committee. Elected 8-0-1. SB nominated to chair Outreach Committee. Elected 8-0-1. Joe nominated to chair Leadership Development. Elected 8-0-1. Discussion of Board Process. AL will prepare packets. SK will record and review action items. MH will do board monitoring surveys. We will find a job for Cole. B.9 Report: KM moves to adopt. SK seconds. Motion carries 9-0-0. A.5 Report: KM moves to adopt. AL seconds. Motion carries 8-0-0. SB moves to enter internal session to discuss D.4, D.9, Operations Update. AL seconds. Motion carries 8-0-0. This is going to be a long post, but I hope everyone reads it to the end and offers comments either below or through info@blackstar.coop or board@blackstar.coop. The workers and the Board want to be responsive to your preferences as member-owners, and that can only happen if we have a clear idea of what those preferences are. On Sunday, October 26th, we held our Fall Members’ Assembly Meeting and spent a significant amount of time talking about the basic values, innovations, and means of expanding into a second location. This portion of the meeting was organized around the Co-op’s Ends Policies, or end goals of the Co-op, known as the Five Points of the Black Star: Patron Experience, Community Involvement, Environmental Sustainability, Worker Treatment, and Financial Development. How much flexibility do employees have to do their schedules? One or more asterisks (*) means that number of additional people noted their support for the idea and italicized text means the idea was mentioned in another Point. Two items mentioned are things we already do: sell gift cards and use sustainable ketchup cups. How about rain water collection? Let’s continue the discussion here. Given our five Ends policy points and with a focus on things we could do at a second location, what do you think? What would you like to see the Co-op doing?